Peter Morici argues that Obama's failure to take a tough stance with China is costing the US jobs by allowing China to keep products artificially cheap. Also, Treasury Secretary Timothy Geithner was unable to get G20 nations to agree to trade surplus limits, as countries like Japan and Germany opposed the proposal. See the following post from The Street. T he Federal Reserve likely will launch next month a second round of quantitative easing. But don't expect QE2 to make big waves. The failure of the talks of G-20 finance ministers permits China to continue to subvert Fed efforts to rekindle U.S. growth. More Fed purchases of Treasury and mortgage-backed securities would drive down borrowing costs and it is hoped boost business investment and home purchases. However, big corporations are already flush with cash and mortgage rates are near record lows, and the potential benefits from additional monetary promiscuity are limited. U.S. businesses lack customers, and even zero interest rates won't inspire a company such as General Electric (GE_) to build factories and add workers if light bulb sales are stagnant. Without more jobs, prospective homebuyers are too nervous to quit renting or purchase bigger homes. Moreover, China's export-oriented development policies and undervalued yuan subvert the impacts of U.S. monetary policy on the demand for American products, and U.S. investment, hiring decisions and housing markets. Through the boom years, Beijing printed yuan to purchase hundreds of billions of dollars in currency markets. That made the yuan and Chinese products on U.S. store shelves artificially cheap, and President Bush stood idle as imports from China and rising prices for imported oil pushed the U.S. trade deficit to more than 5% of gross domestic product from 2004 to 2008. When Americans spend that much more abroad than foreigners purchase in the U.S., American-made goods pile up in warehouses and a steep recession results, unless Americans spend much more than they produce and earn. During the Bush boom, China facilitated such folly by using its dollars to purchase U.S. Treasury securities. That kept U.S. long interest rates artificially low, even in the face of Fed efforts to reign in spending. From 2003 to 2006, easy terms prevailed on mortgages, homeowner lines of credit, car loans, and credit cards, even as the Fed raised the federal funds rate. Americans borrowed against their homes, pushed real estate prices to unsustainable heights, and spent on Chinese goods at Wal-Mart (WMT_) until the credit bubble burst in late 2007 and 2008. 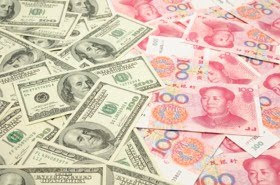 China continues to recklessly print yuan to buy dollars and U.S. Treasuries, and all those yuan create inflation and real estate speculation in China that Beijing cannot contain. With the dollar still overvalued by some 40% or 50% against the yuan, the U.S. trade deficit with China, and other Asian countries practicing similar policies, is growing again. This deficit saps demand for U.S. goods and services, slows U.S. recovery, and suppresses U.S. land values, even though big banks are already flush with cheap credit from the Fed. Nothing the Fed does can appreciably accelerate U.S. economic recovery or stem U.S. deflation as long as China continues to print yuan, buy dollars and U.S. securities, and make its products artificially cheaper than its comparative advantages warrant, unless the United States responds with equally strong countermeasures. Coupled with its high tariffs and administrative barriers to imports on anything the Chinese can make themselves, no matter how awkwardly or inefficiently, Beijing is hogging growth and jobs, and spreading unemployment and budget misery from Sacramento to Athens. At G-20 finance minister's talks, Treasury Secretary Timothy Geithner failed to accomplish a grand bargain to wind down Asian trade surpluses and boost demand for what Western economies make. Opposition from champion mercantilists Japan and Germany, who pioneered some of the very tactics China now exploits on a grander scale, caused the G-20 to adopt only soft, modest goals and no remedies for deficit countries like the United States. Meanwhile China's yuan policy and trade barriers make the Fed nearly irrelevant but for crisis management like bailing out big banks and European governments that make fatal mistakes. Worse, President Obama's failure to take strong action against Chinese currency manipulation -- for example, a tax on dollar-yuan conversion to make the price of Chinese products reflect their true underlying cost -- cripple the jobs creation effectiveness of his $800 billion stimulus spending and broader efforts to resurrect the U.S. economy. President Obama's exclusive reliance on diplomacy renders impotent U.S. monetary and fiscal policies, smothers jobs creation, and visits unconscionable hardships on American workers. This post by Peter Morici has been republished from The Street, an investment news and analysis site.